However Michael's Diaries are more than just Monty Python and give great insight into the life and times of one of the world's most acclaimed, yet understated, comedy writers and performers. It also touches on many of the side projects that the various Python members worked on during the same period including Michael's Ripping Yarns TV series, John Cleese and Faulty Towers, Terry Gilliam's movies Jabberwocky, Brazil and Time Bandits, Eric Idle's movie The Ruttles and more. Along the way Michael name drops some of the world's biggest celebrities who became friends including the late Beatle, George Harison, and the late Rolling Stone, Keith Moon. There's also some insight into the behind the scenes workings of the iconic US, TV show Saturday Night Live which Michael was invited to host three times during this particular decade. Something Python is known for is never crediting who wrote what on their various projects. Preferring to maintain that, regardless of individual contributions, the final project is the sum total of input from everyone. Michael's diaries break the silence in this regard crediting where the initial idea for many well known Python ideas began. For example, even though these diaries only catch the very beginnings of Monty Pythons Meaning of Life, the World War II scene, where a unit of soldiers present their commanding officer with a clock was originally conceived by Terry Jones. The diaries are a big read and, whilst Michael's writing style is easy and fluent, occasionally I found myself powering through entries about Michael's daily life in anticipation of more inside information about the two major movies of the period Monty Python and the Holy Grail and Monty Python's Life of Brian . It's so rare that you get to discover how a movie was made right from the very germ of an idea that will eventually become the script. I found this aspect of the diaries fascinating - particularly with Life of Brian which began as a Life of Christ movie (and could've subjected the Pythons to far more controversy than they eventually got when Brian was released). The contrast between writing Holy Grail and Brian was also interesting. Where Grail was written mostly on British soil, the team, with more money available, decided they needed to travel to the tropics to write Brian (oh to be able to travel anywhere just to provide the best writing environment). For me I would've liked more behind the scenes description of key Python, creative meetings but that really isn't the kind of thing you get from a diary. Diaries are more about highlights and moments that stood out from the rest of the day. In Michael's diaries you get that in spades. Each entry is fairly short and covers that which most remained in Michael's thoughts when it came time to write the diary. Also disappointing was, as you would expect, the diaries have no real ending. We get a taste of the early stages of Monty Python's Meaning of Life and Terry Gilliam's Time Bandits and then nothing. The diary just stops at the end of 1979. Presumably leaving the way open for Michael's diaries from 1980 onwards to be published in a future tome. I think I was hoping for some closing remarks from Michael. Perhaps a reflection on these first ten years. How his thoughts on Python's future then, compare with what actually transpired. I hope Michael will publish future diaries. Not just to feed my interest in Python but because Michael's ambition to travel is already taking shape during the Python years. I'm sure his journey from Python to Travel documentary maker is every bit as interesting, all the while, his path has kept crossing with former Pythons on various projects. 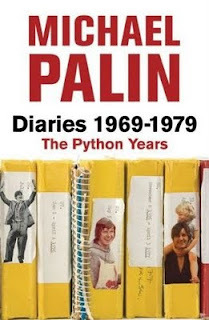 For anyone who's a Michael Palin or a Monty Python fan this will be an interesting read. For those of you trying to make a career out of writing this may well be a burst of inspiration too. Thank you for giving me a review of a book in my possession which I have YET read!! Carl bought it for me I think last Christmas! Looks like your copy is the soft back, but mine is the hard back with dust cover, whch I think sold for nearly $50! Did you purchase that copy yourself, as I expect it was much cheaper in soft back? I shall be reading my copy when I finally get to it! I must give it priority over the dozens of other books waiting for me to read! I have enough to see me out of this world! I am in the stage of just having bought a set of four upright storage cubes in white laminate same as my bookcase to house all my spare books under the coffee table and the ones overflowing in the front of the bookcase! It's to go behind the door next to said bookcase! Just have to get onto Carl 'help' put it together, as it doesn't look as simple as I first thought! I already had to ask him to bring it home for me as the flat pack was too heavy. Got it in the sale at Crazy Clark's in Gozzy for $30. He said to ask if I needed any help with it, but he'll end up doing it - I'll just hand the 20-odd screws to him that come with it! Pleased to read what the book was like though. Thanks! My copy was a birthday present (and yes it's the softback version). This isn't the kind of book I'd buy but it's the kind of book I'd like to have bought for me (lucky that). I guess you'd describe it as a 'luxury' book. Something you'd buy to spoil yourself. It seemed to take me forever to read this but it's still a good read. You'd probably like it for the fact that Michael's based in the U.K. and gives a few notes about other well known comedians like the Two Ronnies, Spike Milligan and others.